Taco night is always a favorite night in our house. We’ve been having taco night about once a week for the past few weeks. Instead of using ground beef or chicken for our tacos, I’ve been using ground turkey. 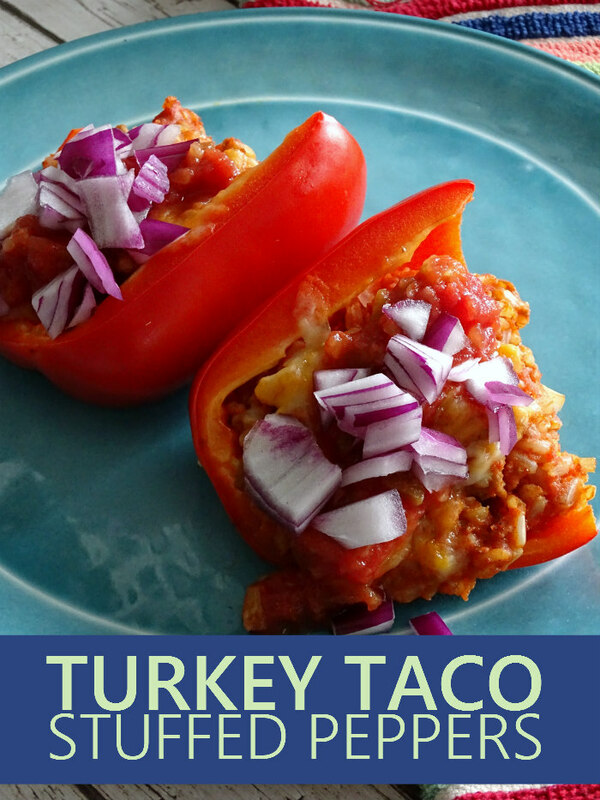 It creates a leaner, more protein-packed taco meat that’s delicious over brown rice (my favorite alternative to boxed taco shells)! All I do is brown my ground turkey and add taco seasoning. Then, I serve it over brown rice with additional toppings like shredded cheese, salsa, hot sauce, olives, and sour cream. So good! However, one package of ground turkey makes quite a lot for the two of us. Sometimes I split the package and freeze the rest, or we split leftovers for lunch. 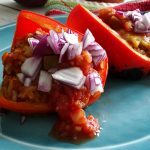 This week, I remembered a recipe I had made a while ago for Turkey Taco Stuffed Peppers. It’s a great way to use up our taco leftovers! With such a large vegetable garden this year, I hope we get a lot of peppers out of it, as we have in past years, including bell peppers. I have been using them more and more in my cooking. Especially red bell peppers! They’re great for roasting and sauteing and have a great sweetness to them that you don’t get in a green bell pepper. And while I used to omit onions from everything, I’m starting to warm up to them again. Red onions being my favorite. I think I have a thing for red veggies! 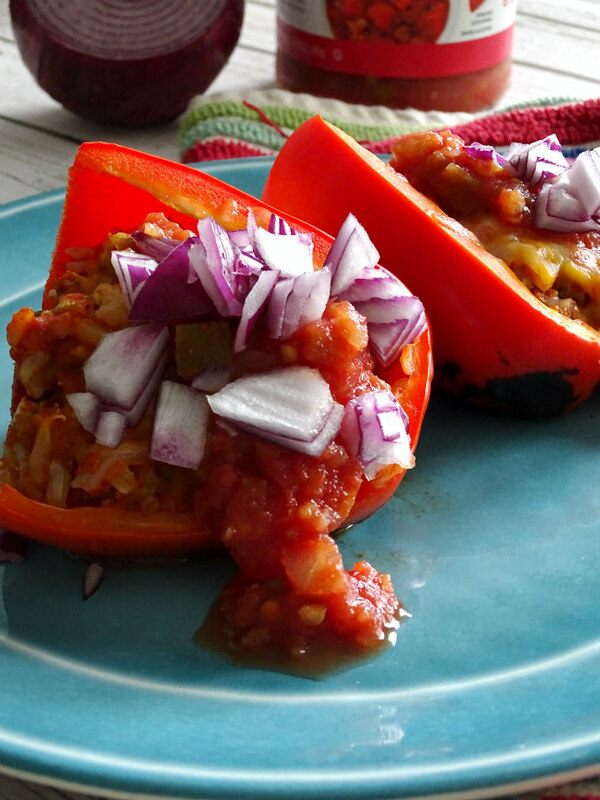 So, of course, I decided to stuffed my leftover taco turkey meat and brown rice in a red bell pepper. I charred my red peppers, as I usually do, before stuffing them and baking them in the oven, topped with cheddar cheese. 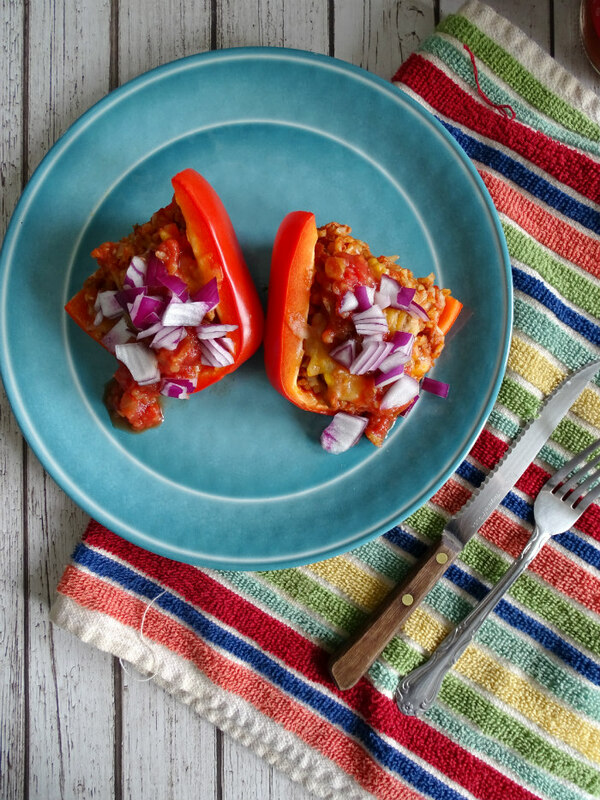 When they were done baking, I added a spoonful of mild salsa on top of each pepper half and garnished them with more chopped red onion. Next time, I’ll add some sliced black olives and chopped cilantro. Brown the ground turkey in a skillet over medium heat with the onions and garlic. Add taco seasoning, water, rice, salsa, and tomato sauce. Bring mixture to a boil. Reduce heat to low and simmer for 20 minutes, or until rice is cooked. Cut the bell peppers in half lengthwise, removing stem and scraping out the seeds and membranes. Fill each pepper with meat mixture and place on baking sheet. Sprinkle cheese over the top of each pepper. If using leftover turkey taco meat, mix the meat with brown rice. Then, add the rest of the ingredients to the skillet and continue to follow recipe instructions. What’s your favorite way to stuff a pepper?